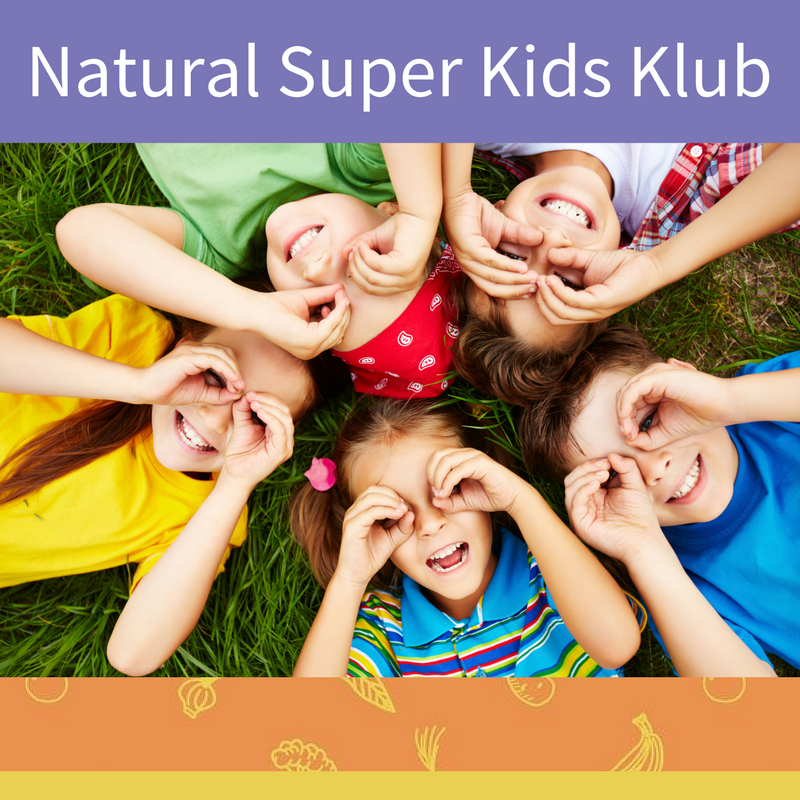 Has your child come down with molluscum contagiosum? This common childhood infection might not be particularly harmful, but it is highly contagious. The good news is that there are natural remedies that can help your child to recover quickly from the infection. There are also ways to minimise the spread of infection if your child has molluscum. 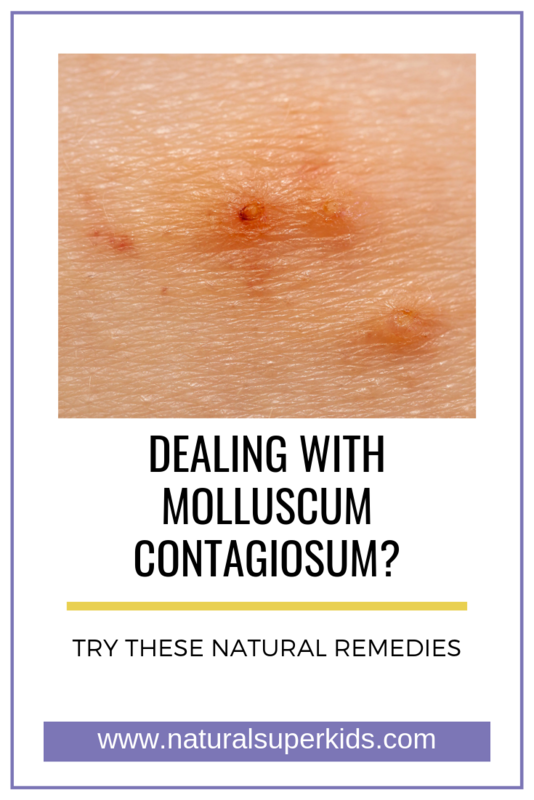 Watch the video or continue reading below to learn about managing molluscum contagiosum naturally. Molluscum is a very common skin condition that is usually seen in kids. It is a viral infection that presents as raised spots on the skin. Doctors may misdiagnose these as warts, as they can look very similar. Molluscum is highly contagious, both in terms of spreading to other parts of the body and to other children. Most adults tend to have natural immunity, as they will have been exposed to the infection at a young age. Any child exposed to the virus is at risk of infection. But it tends to be more common in kids who have a weakened immune system or those with allergies and atopic conditions such as asthma. This is because the immune system has limited resources, so dealing with allergic responses leaves little for fighting off viruses like molluscum. This virus is fairly harmless. It’s not usually painful, although it can get a little itchy or irritated. Sometimes, the spots can become infected, which can become an issue. There are not many pharmaceutical options available for molluscum. Doctors will usually advise you to let the virus run its course, because it will go away eventually. But it is an unsightly infection, and in some children, it could linger for many months. 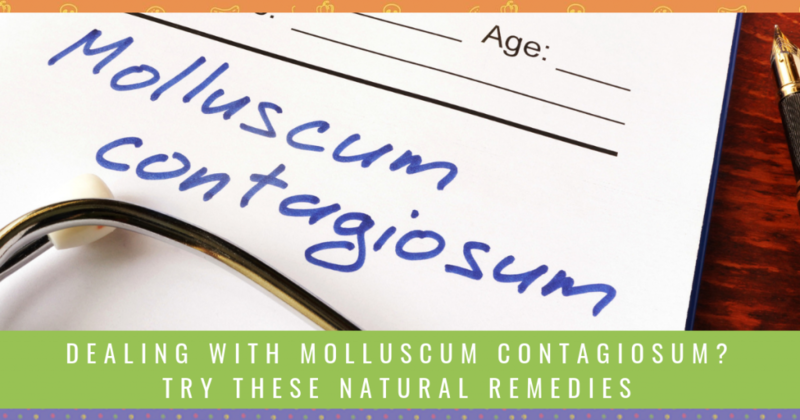 There are a few different ways you can approach a molluscum infection from a naturopathic point of view. Many people focus on what can be applied directly to the skin. But I prefer to take a more holistic approach by treating the infection from the inside out alongside external remedies. If your child already has molluscum, there are a few ways to minimise the spread – both from body part to body part, and to other children. The virus thrives in warm water, so it is often picked up in a pool or a bath. If your child has it, avoid letting them bathe with other siblings whenever possible. Baths can also encourage the spread of the infection to other parts of the body, so showers are preferable. You want to avoid swimming pools whenever possible. But if your kids are in the middle of swimming lessons, you can cover up the spots with waterproof bandaids to minimise the spread. When kids are drying themselves after bathing or swimming, you want them to dry the affected areas last. Ideally, you’ll want to wash towels with each use to reduce the chance of it spreading. Finally, try to keep the affected areas covered up with clothing when possible. If you send them to school or kinder with the skin exposed, it is easier for them to pass it on. There are plenty of external remedies that are believed to help with molluscum infections. But there are a few that are particularly beneficial. The two essential oils I recommend for molluscum are tea tree oil and lemon myrtle oil. You can use either, or combine the two. It’s essential to dilute them using a carrier oil such as fractionated coconut oil or almond oil before applying it. Dab onto the affected area at least twice a day until symptoms resolve. Alternatively, you can use apple cider vinegar applied directly to the affected area. Both are similarly effective, so choose whichever one is easiest for you. When it comes to irritated molluscum, there are a couple of simple remedies to reduce the itchiness and soreness. Oatmeal baths are a simple way to soothe irritated skin – simply get some muslin cloth or a stocking, pop some oats into it, and let it soak in the bath as it runs. For very irritated and even broken skin, chamomile tea can be used directly on the skin. Add 4 tea bags into a cup of hot water, allow to cool, and apply it with a cotton bud. You can also apply a calendula cream or ointment. The best way to get results with molluscum is to work on the internal defenses alongside external remedies. Molluscum is a viral infection, so you want to support the immune system as it kills off the virus. Diet plays a big role in supporting immunity. You want to focus on increasing nutrient-rich foods, especially those high in antioxidants. Antioxidants are found mostly in brightly coloured fruit and vegetables such as berries, beetroot, capscium and green leafy veggies. One of the main dietary factors that can deplete immunity is refined sugar. A high sugar intake can suppress the immune system by up to 45% for up to 5 hours after consumption. The more regularly that your child is consuming large amounts of sugar, the more their immune system will keep getting suppressed. If they come across molluscum while their immune system is low, the more likely they are to pick up the virus. This doesn’t mean you have to eliminate sugar and processed foods completely. But you can find a good balance with treats and nutritious snacks. For example, when they get home from school, you can institute a rule of eating a fresh snack like a piece of fruit or a smoothie before they can have a packet snack. That way, you’re getting some beneficial nutrients in first. When it comes to molluscum, there are two main supplements that I tend to look to. Zinc is a mineral that is essential for healthy immunity and fighting off viruses effectively. To manage molluscum and other viruses, your kids can consume plenty of zinc-rich foods such as red meat, seafood, fish and pumpkin seeds. But often food isn’t enough, especially if you have a fussy eater. That’s where a high-quality supplement can come in handy. These dosages are short-term, only to be used until the symptoms clear up. You also want to make sure you’re looking for a supplement that uses zinc chelate, as it’s an easily absorbed form of zinc. Medicinal mushrooms are some of my favourite immune-boosting compounds. Mushrooms such as reishi, cordyceps, shiitake and coriolus all have slightly different effects on immunity, so they work well together. When combined, these four mushrooms boost immunity and have direct anti-viral actions, which means they can kill off the virus while supporting the immune system. In clinic, I use a practitioner-only blend that uses all four to overcome molluscum. 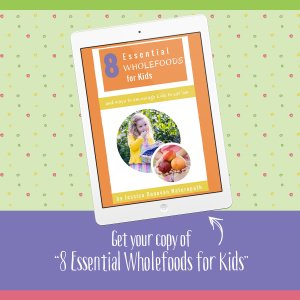 Want to help your child recover from a molluscum infection? I’m here to help. 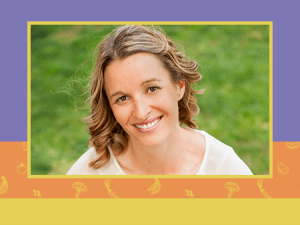 For a limited time, you can get 50% off an Express Consult, where I can offer specific advice and access to practitioner-only supplements to address your child’s molluscum. To book, click here and use to code MOLLUSCUM to claim the special.